Amy Novotny is from a Deaf family, the third generation to graduate from Minnesota State Academy for the Deaf (Faribault), so she's had a lifelong connection to the Deaf community. Her passion for teaching dates to her high-school days, when she did volunteer work with preschoolers. During her college years, she spent summers teaching at Metro Deaf School in St. Paul, the nation's first Bi-Bi charter school. Twelve years ago, she received a job opportunity at RMDS, relocated to Colorado, and has been with RMDS ever since. She started out as a third/fourth-grade teacher, took other positions, such as Curriculum Coordinator, and is in her second year as Director. 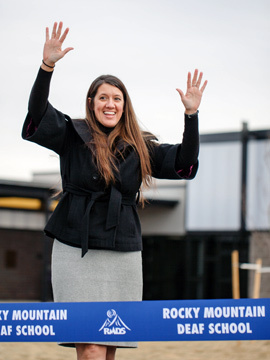 In October 2014, Novotny received the Education Award from Colorado Association for the Deaf in recognition of her making meritorious contributions in working with K-12 Deaf students. The high point of her career, as she sees it, was RMDS's moving from the cramped and inadequate Applewood Grove strip-mall location into a beautiful new and carefully-designed building, RMDS's first permanent home, in December 2014. The entire RMDS population had been involved in the adventure, including the groundbreaking and topping-out ceremonies.